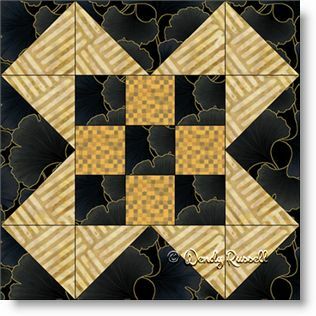 Colour placement in this Nine Patch Album quilt block is what makes this stand out from the crowd. The small nine patch resides in the centre of the block while it is framed by half square triangles and flying geese units to complete the large nine patch. This is a fun and easy block to add to your collection. The sample quilts shown both use sashing between the blocks, but since the sashing strips are the same colour as the background fabric, they seem to disappear. However, the little gold "cornerstones" in the sashing, show up as individual accents for the quilts.